Another series set in Midkemia (The Serpentwar Saga, etc.) begins. And for the many fans already familiar with previous volumes, this one fits chronologically between A Darkness at Sethanon and Prince of the Blood—or so the publishers assure us. 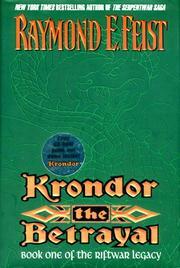 Feist also created the computer games “Betrayal at Krondor” and “Return to Krondor,” which presumably are not unconnected with the present volume. Prominently featured in the story are the Riftwar veterans Squire Locklear and Squire James, along with Pug the magician, Prince Arutha, and the usual villains, evil magic, adroit plot twists, and so forth. Good, bad, or indifferent, Feist’s huge saga simply is, and the fans will lap it up.